I had finally found my Lions. After eight days on the Savanna I’d seen plenty of evidence of Lions but finding them at the watering holes or along the game trails to photograph was proving difficult... until now! 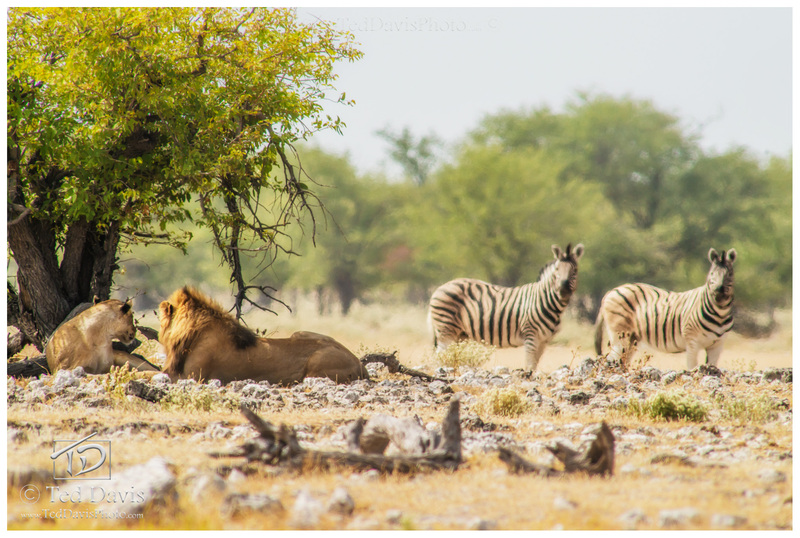 Locked in with a 800mm superzoom lens, I spent hours watching these majestic creatures relax under the midday sun of Etosha. As the mercury crept towards the triple digits, more and more animals made their way to the watering hole for refreshment. It was then I noticed a small group of Zebra crossing behind the lions. After lazing about all morning, the lions were a blaze of energy as they both raised their heads and tracked the Zebra with their eyes. In that moment, the Zebra froze finally taking notice of the lions and realizing how close they were to these apex predators. It was a life or death stalemate in the savanna. Photo © copyright by Ted Davis.